One thing that I love about winters is the plethora of vegetables it brings in with it. There is a huge array of colours & variety to choose from. I love the greenies and use them informatively (which I actually learned from my Mom). So here I am presenting to you a raita made of bathua which is also known as chenopodium in english. Bathua is a green leafy vegetable mostly eaten in Northern India but is now thankfully available everywhere. Here is a picture of it. You need to wash & cut the veggie and par boil it i.e. put the leaves in boiling water and turn off the gas in 2-3 mins. Let it sit in the hot water before taking it out after say 10 mins. Pour it out in a strainer and put it under water. Let it cool before making a paste of it in either in mixer/ blender. Mix the curd and the paste with a Rai/ mathani/ whisker. Add a little water if you feel the raita isn’t liquid enough. 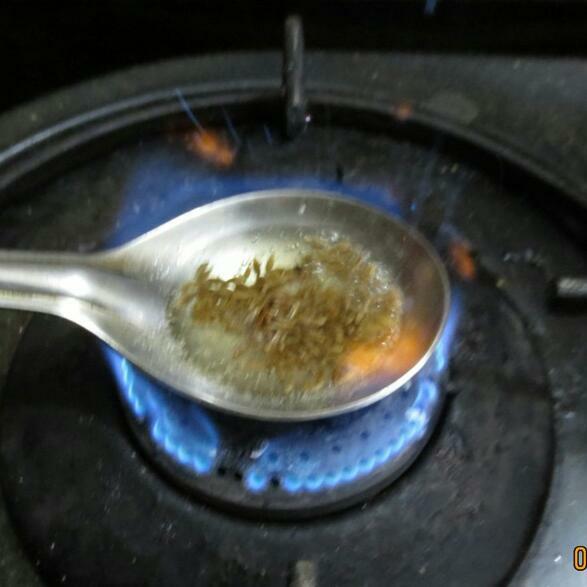 Take the oil the ladle and put it on the flame, add the jeera & Heeng to the oil. Once the jeera catches flame take it off the gas, add the chilli and put it in the curd and cover it. Trust me when you open the utensil you will be treated with the most heavenly smell of heeng. Add salt to taste and the raita is ready to be served. Unfortunately I forgot to take a picture of the final product but the last image is very near to what it looks like. The best part about this raita is that it is healthy giving you loads of fibre and most importantly it looks so beautiful all green green. My Mom used to make this specially when had guests at home and they used to be surprised with the color of the dish so despite this being something very simple & run of the mill it used to be the star of the evening. That looks yum but I've never heard of this vegetable before! Don't tell me...you have put up ur pic!!! wow!!! I make this bathua raita but have never done the final baghar that you mentioned. Will try it out tonight! bathua ?? gee... what veggie is that ? gujarati please? !